In Re Bach Estate, 2017 BCSC 548 a testator left his entire estate to one sister in a one page will, signed the night before he died to the exclusion of his other sisters, children and stepchildren. Ms. S, the lucky sister applied to court for a declaration that the one page document and the gift of the entire estate to her was valid. One of the stepchildren opposed the application alleging that Mr. B did not have the testamentary capacity to make a will. Under the law, a person must be able to comprehend and recollect what property they own, the person receiving said property, how much property is given to each person and the nature of the claims of anyone who is excluded. The leading case dealing with testamentary capacity is Banks v. Goodfellow (1870), L.R. 5 Q.B. 549 and the test for capacity to make a will is described as being “not particularly onerous”. 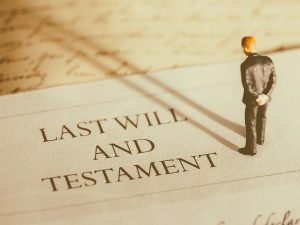 Where a will is made by a testator who knew and approved the contents of the will and is executed with according to the formalities required of a will under Wills, Estates and Succession Act, SBC 2009 (“WESA”), the law presumes that the deceased person had capacity to make a will. In this, the will case was witnessed by a doctor who heard Estthe deceased read the document aloud and indicated that he agreed with its contents. Based on this Mr. Justice Kelleher found that the Mr. B was presumed to have capacity and that no evidence displaced this capacity. Additionally, evidence from other relatives indicated that Mr. B had told others about his plan to change his will. After finding that r. B had the necessary capacity to make a will, he determined that the will and the gift under the will were also valid. Section 37 of WESA lists the requirement for a will to be valid, which mandate the will must be in writing, signed by the will-maker in the presence of 2 more witnesses present who are also required to sign the will in the will-makers presence. Section 40 of WESA also sets out requirements for witnesses of a will. A witness to a will must be 19 years of age or older. Section 40 also provides that a person may witness a will even though they receive a gift in that will, but the gift may be declared void. Although Mr. B’s one page will signed before his death met all the requirements one of the witnesses to the will was the husband of Ms. T, making the gift to Ms. T void unless the court declares otherwise. Prior to WESA, once a gift was made to such a person the court had no discretion to declare that the gift was valid; it was void. Under WESA, the court has discretion to declare the gift valid if they are satisfied that the will-maker truly intended to make that gift to the person. The evidence of friends and relatives of Mr. B showed that he intended to leave everything to Ms. T and Mr. Justice Kelleher ultimately found that the gift not to be void on that basis.